“Sprinting is like learning a language. There’s only one way to do it – the technique must be correct and it’s all about repetition”. This is the straightforward logic that Freddy Farmer preaches to his pupils day in day out as he steers them towards upper and lower body co-ordination. 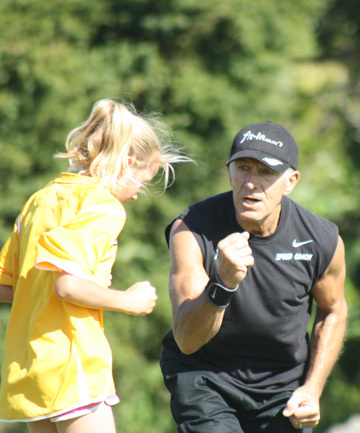 Farmer is New Zealand’s only recognised Speed Endurance coach, and he imparts his years of wisdom week after week on the up-and-coming youngsters at the Eastern Suburbs Academy. In this week’s blog we meet the man dubbed “Fast Freddy”. Freddy Farmer arrived in New Zealand at the ripe old age of 60; the profession on his visa application read “Speed Endurance coach”. In what must surely be the very definition of “no-brainer”, Immigration were quick to grant Freddy his visa, given that there is not one other of his coaching kind in all of New Zealand. Freddy has learnt his trade from Margot Wells, widely respected around the world as a pioneer in Speed Endurance, and coach (and wife) to 1980s Olympic 100m Gold and 200m Silver Medalist Alan Wells. “I was always a rugby boy back in England”, Freddy proclaims, “scrum-half, then to centre and wing. I was always into my sprinting so it was only natural really”. As captain of his club, Surrey-based Effingham, Freddy was responsible for everything, including coaching. It was here that he began to implement some of his passion for sprinting and sprint endurance. “I’d always been interested in how the body works – why can some people move quicker than others? Sprinters always look neat and tidy when they run, their body movement and so on. I’d always thought about it and I used to bring this sort of stuff into my rugby training”. So focused with Farmer on implementing his philosophies into training that one team even had t-shirts made that read “Freddy makes me sick”. His focus and passion for speed endurance would eventually bring him to where he is today – a professional coach – and it fits in with the fabled ‘School of Speed’ creator Margot Wells. In brief summary, fearful as I am that majority of Kiwis will not be well-learned in the Wells family history, Margot was herself a Scottish sprinter of some ability, but gave up her ambition to compete in order to train her husband Alan Wells. Wells, in the late 70s, was a second rate long jumper, however thanks to the intricate coaching techniques employed by his wife would go on to claim 100m Gold at the Moscow Olympics (along with 200m Silver) and various other Grand Prix victories. Margot Wells now runs her own company – “Well Fast – School of Speed” – and is universally recognised as the defining voice on Speed Endurance. Her client list is vast and includes various international sportsmen, England rugby stars Danny Cipriani, James Haskell and Mike Brown to name but a few. In 2007 Freddy Farmer took his chance to meet and be tutored by Wells, and learn the skills and add the valuable credentials required to succeed. “She’s a brilliant lady, a really smashing lady. She’s changed everything, all with simple logic. 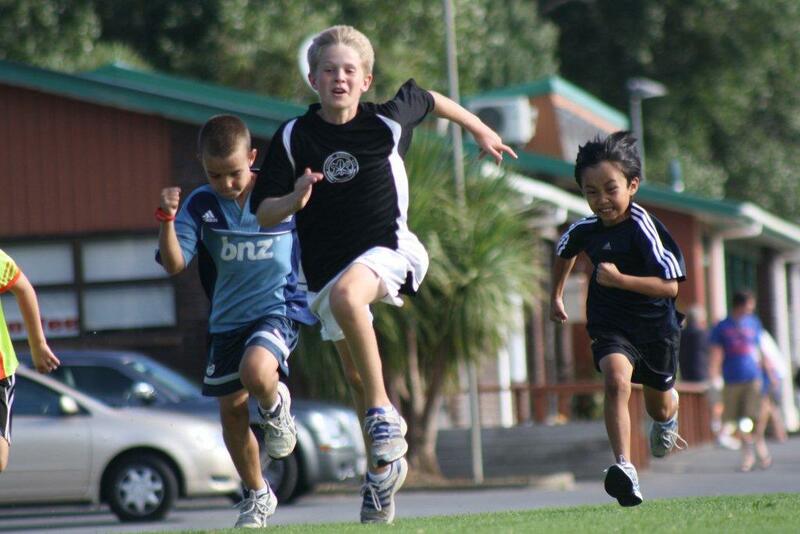 Even 10 years ago coaches would be getting to pull sledges and parachutes to get quicker; Margot argued this was rubbish – why would you teach the brain that? When Freddy and his family decided to make the move to New Zealand he brought with him his credentials as a graduate from the Wells School of Speed. There weren’t many takers – “lots of places are pretty old school, they haven’t got a clue really” – until our own pioneer Chris Ruffell made contact with Freddy and invited him for a meeting. Before long ‘Fast Freddy’ was signed up at Madills Farm. Embarrassingly naive to the whole concept, I then asked Freddy what exactly Speed Endurance actually is. Freddy will often be seen on weeknights at Madills putting the youngsters through their paces. Whether it’s frog jumps, hurdles or jumping from one ring to the next, the core logic is simple. “I always say to a new group – you’re here to learn how to sprint, not how to run as fast as you can. It’s about the technique, it must be correct. Sprinters aren’t simply born with ‘it’ – that’s cobblers. You can create them”. 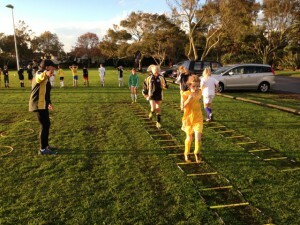 Fast Freddy is helping create speedy footballers for the Eastern Suburbs. Having initially started in a more advisory role, Freddy has been given license and budget to expand his program and now runs sessions for large groups of youngsters and the ESAFC Academy. Some of his graduates, people like Jonty Thompson and Ben Allan, now grace the Mens Premiers and Reserves on a regular basis. He also trains Alice Tilley, who’ll be representing New Zealand at the Junior World Orienteering Championships in Bulgaria. What’s abundantly clear from talking with Freddy is his passion for what he does. He lives and breathes Speed Endurance and he’s equally as passionate about teaching it to the future stars of the Eastern Suburbs. “The club has been brilliant in buying into this and moving it forward. 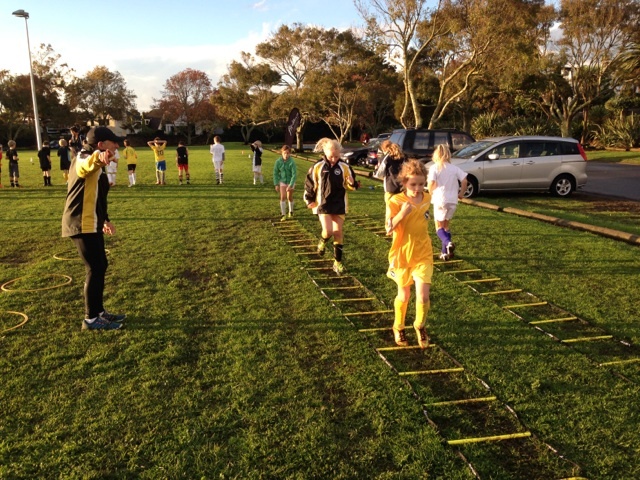 No other club can offer this program, no other club can offer what Eastern Suburbs has got”. And that’s because no other club has Fast Freddy – the only Speed Endurance coach in the country.